In the new Subscription Economy, companies succeed by selling meaningful business outcomes – not just products – and no one is more committed to that idea than Sandy Hogan, vice president of Business Transformation at Cisco, a global technology leader. Hogan is part of a new wave of innovative, outcomes-focused executives featured in Competing for Customers, a best-selling new book on customer success. Cisco is convinced that supporting customer success, from opportunity identification to delivery of business outcomes, will create real differentiation for the company. After all, customers are demanding it for good reason. Sandy Hogan, vice president of the Business Transformation team at Cisco, shares how Cisco fundamentally is changing its sales organization to achieve its goal of outcome-oriented business engagements in Competing for Customers: Why Delivering Business Outcomes is Critical in the Customer First Revolution. Co-authored by Oracle Chief Customer Officer Jeb Dasteel and Mainstay Co-founders and Managing Directors Amir Hartman and Craig LeGrande, the book provides practical strategies and insights for cultivating customer success. Business-to-business customer expectations have changed. To survive – and thrive – in today’s economy, where customers constantly reevaluate their purchases and look at cutting edge options never available before, organizations must prioritize customer outcomes. Delivering customer success means radically changing the way organizations engage with customers – from sales, to marketing, to engineering and support. Competing for Customers presents a framework for this critical transformation. The authors – Dasteel, Hartman, and LeGrande – identify the unifying principles and tactics of customer success delivery and guide readers through every step of planning and executing success, including providing clear tools and templates based on actual practices that are leading the way. The book provides business leaders with a roadmap for delivering customer success by changing the way organizations engage with their customers. Learning from industry customer success innovators like Sandy Hogan and executives from Rockwell Automation, GE, and Telogis, readers understand how to make sure their customers are achieving measurable business outcomes. 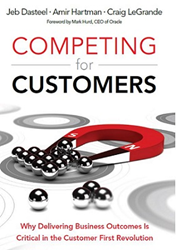 Competing for Customers was recently published by Pearson. For more information and to purchase a copy, visit: http://www.competingforcustomers.com. Through April 2, a specially priced electronic version of the book is available at Pearson’s eBook Deal of the Week site. As Vice President, Business Transformation at Cisco, Sandy Hogan leads a high-energy team focused on transforming how Cisco works with Customers so they can in turn deliver business value. Follow Sandy @sandyhogan. Jeb Dasteel holds the position of Senior Vice President and Chief Customer Officer at Oracle. He is responsible for driving the relentless focus on customer success into all aspects of the Oracle business. Follow Jeb @jdasteel. Amir Hartman, founder and managing director of Mainstay, is a leading authority on corporate and technology transformations, and works with customers to help develop and execute customer success strategies. He is the author of several influential books, most recently Ruthless Execution (Pearson, 2014). Follow Amir @amir_hartman. A senior advisor to leading high tech companies, Craig LeGrande is founder and managing director of Mainstay and co-author of Ruthless Execution. LeGrande leads a world-class team helping clients deliver innovative customer success strategies. Follow Craig @craig_legrande. Mainstay is a recognized leader in helping organizations design and execute innovative customer success programs. Mainstay serves as an independent advisor to some of the most admired companies in the world. For more information visit http://www.mainstaycompany.com.